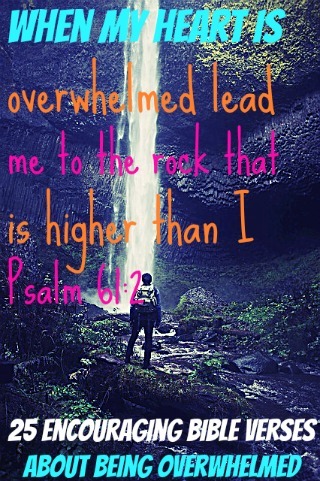 When feeling overwhelmed and stressed out instead of focusing on the problem put your focus on God. Trust in God and His promise that He will always be there for you. Sometimes we just need to stop everything and work wiser. We need to stop working so hard and rely on the power of God. We cast so much doubt on the power of prayer. The television won’t help you, but being alone with God will. There is a special peace that you are missing out on if you don’t pray. God will help you. Stop putting prayer off. You need to be reading Scripture daily as well. When I read Scripture I always seem to gain more strength and encouragement from the mighty Breath of God. May these Scripture quotes help. 1. 1 John 4:4 Ye are of God, little children, and have overcome them: because greater is he that is in you, than he that is in the world. 3. Matthew 19:26 But Jesus beheld them, and said unto them, With men this is impossible; but with God all things are possible. 4. Psalm 23:3-4 He restores my soul. He leads me in paths of righteousness for his name’s sake. Even though I walk through the valley of the shadow of death, I will fear no evil, for you are with me; your rod and your staff, they comfort me. 6. Jeremiah 31:25 I will refresh the weary and satisfy the faint. 7. Isaiah 40:31 But those who trust in the LORD will find new strength. They will soar high on wings like eagles. They will run and not grow weary. They will walk and not faint. 8. Psalm 61:1-4 O God, listen to my cry! Hear my prayer! From the ends of the earth, I cry to you for help when my heart is overwhelmed. Lead me to the towering rock of safety, for you are my safe refuge, a fortress where my enemies cannot reach me. Let me live forever in your sanctuary, safe beneath the shelter! 9. Psalm 94:22 But the LORD is my fortress; my God is the mighty rock where I hide. Stop thinking about the problem and seek peace in Christ. 11. Isaiah 26:3 You will keep in perfect peace all who trust in you, all whose thoughts are fixed on you! 12. Psalm 55:22 Cast thy burden upon the LORD, and he shall sustain thee: he shall never suffer the righteous to be moved. 13. Philippians 4:6-7 Be careful for nothing; but in every thing by prayer and supplication with thanksgiving let your requests be made known unto God. And the peace of God, which passeth all understanding, shall keep your hearts and minds through Christ Jesus. 14. Psalm 50:15 and call upon me in the day of trouble; I will deliver you, and you shall glorify. 15. Proverbs 3:5-6 Trust in the Lord with all thine heart; and lean not unto thine own understanding. In all thy ways acknowledge him, and he shall direct thy paths. 16. Ephesians 6:10 Finally, be strong in the Lord and in his great power. 17. 1 Corinthians 16:13 Be careful. Hold firmly to your faith. Have courage and be strong. 18. Philippians 4:13 I can do all things through Christ which strengtheneth me. 19. Romans 8:37-38 No, despite all these things, overwhelming victory is ours through Christ, who loved us. And I am convinced that nothing can ever separate us from God’s love. Neither death nor life, neither angels nor demons, neither our fears for today nor our worries about tomorrow–not even the powers of hell can separate us from God’s love. 20. Psalm 136:1-2 Give thanks to the LORD, for he is good! His faithful love endures forever. Give thanks to the God of gods. His faithful love endures forever. 21. Isaiah 41:13 For I hold you by your right hand–I, the LORD your God. And I say to you, Don’t be afraid. I am here to help you. 22. Philippians 1:6 And I am sure of this, that he who began a good work in you will bring it to completion at the day of Jesus Christ. 23. Romans 15:4-5 Such things were written in the Scriptures long ago to teach us. And the Scriptures give us hope and encouragement as we wait patiently for God’s promises to be fulfilled. May God, who gives this patience and encouragement, help you live in complete harmony with each other, as is fitting for followers of Christ Jesus. 24. John 14: 1 Let not your hearts be troubled. Believe in God; believe also in me. 25. Hebrews 6:19 We have this as a sure and steadfast anchor of the soul, a hope that enters into the inner place behind the curtain.